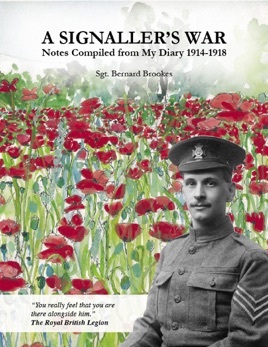 Sergeant Bernard Brookes was a signaller in World War One. He recorded his day-to-day experiences in notebooks, which he wrote up later during convalescence. He describes unsentimentally the appalling conditions in the trenches and includes the famous Christmas Truce, as well as humorous exploits during rest periods and even while under fire (including chimney-climbing and the chicken incident). After ten months in Flanders, Bernard was tasked with going ‘over the top’ to the captured lines to deliver an order – after two signallers had already been killed trying. Covered in mud and scrambling over dead bodies during heavy bombardment, 22-year-old Bernard achieved his mission but suffered shellshock. He was invalided out of active service and spent the rest of the War at various military hospitals, first as a patient and then as a staff member. He never regretted joining the Army.